#BriRunsAMarathon … It’s already been a month of training! I’ve never been a runner. I’ve never trained for a marathon before. But in October I’ll be running the Houston Half Marathon! I started a 12-week training plan a month ago. The first couple weeks of training were very challenging for me. I had all the motivation, but the most I could run was 3 miles with MANY long walking breaks. I remember the last day of my first week of training, I pushed myself to finish my whole run without walking breaks… and let me tell you… a miserable 3.5 miles in the Houston heat and humidity left me ready to throw the towel in. The unbearable heat drove me to stuff my sports bra with ice a couple times (sweet relief that lasts like 3 minutes haha!) and I was so tired and out of breath on my way back home that I decided running a half marathon was just one of my exciting but crazy and impulsive ideas. That same day, after taking a long, relaxing bubble bath and reading several articles about marathon training for beginners, I realized my crazy and impulsive idea wasn’t too bad. I understood that it’s a process and each hard workout will bring me closer to my goal. I decided to keep running. Plus I had already posted on Facebook and Instagram letting the world know I was running a half marathon… and my boyfriend bought me an amazing pair of running shoes… I was under so much pressure! Haha! Today, I’m almost done with my 5th week of training and I can’t express how happy and accomplished I feel. I’m now able to run 6 miles without walking breaks and I know I’m on the right track to accomplish my goal (I know walking breaks are important and I take those when I need to, but sometimes I like to challenge myself). A half marathon is a 13.1-mile race (21.098 kilometers). A full marathon is a 26-mile race (42.195 kilometers). It takes time to train and get ready for a half marathon. I had to commit to a 12-week training plan that forces me to run five days a week, including some weekend days. Who wants to run during the weekend? Finishing times for most half marathons range from a little over an hour for elite runners to 3+ hours for beginners. I’m a beginner so I’m thinking it’ll probably take me three hours to complete the 13.1 miles. Running a half marathon helps you stay motivated to run. I don’t like running. If you ask me…. I hate running. If it wasn’t because I’m training for my half marathon, I wouldn’t be running more than three miles a week. When training for a half marathon, you’ll discover new running routes and places. A half marathon will force you to find new places to run, since you’ll be doing long runs every week. You need different scenarios to keep you distracted from getting bored when running for more than one hour. Training for a marathon forces you to follow a structured and organized schedule. In my case, I have to work around my work and school schedules. You get a medal and a shirt. Honestly, this is one of the things I’m looking forward to the most! Haha! Having a reminder of your accomplishment is always great for a motivation boost. Not to mention that being a half marathoner gives you a lifetime of bragging rights. While the half marathon distance is growing in popularity, the number of people who’ve completed a half marathon is still very small. As a beginner, the goal is to complete the race more so than to compete. Races are rarely cancelled due to weather conditions so I have to be prepared for whatever Mother Nature throws my way. Most marathons have charitable recipients so your run supports a great cause! 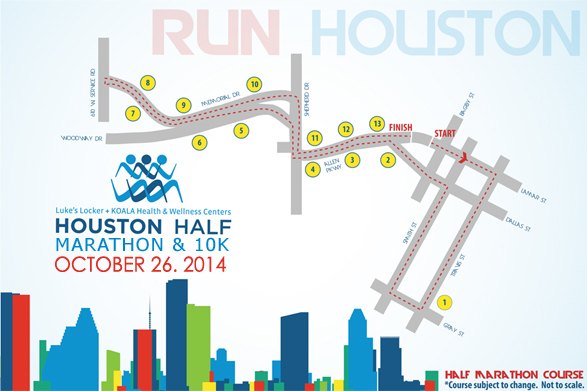 A percentage of the proceeds from the Houston Half Marathon supports the work of the Memorial Park Conservancy. The body achieves what the mind believes. I am learning that my attitude really does affect my run! I really enjoyed reading this Bri, being a runner has help me to know myself better over the years. Felicidades con tu nuevo blog!